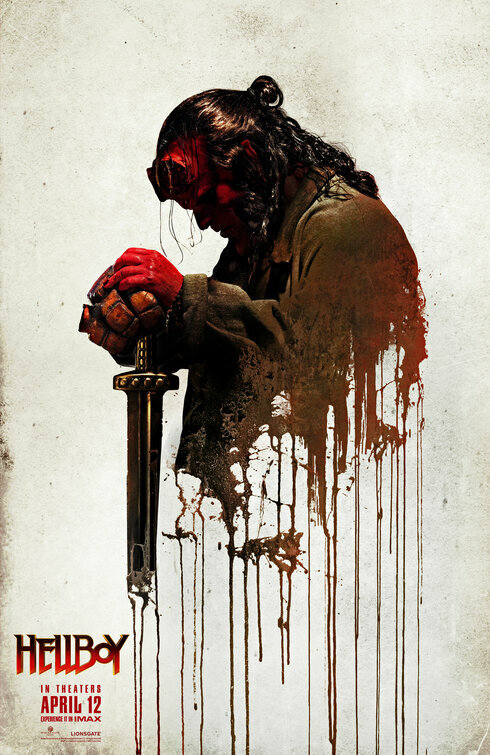 So, Hellboy, a movie that caused a stir among the masses when it was announced, or rather, that subset of the masses that care about such things as genre and comic book movies, and even then, a further subset of the masses that cares about remakes and reboots. It is a stir that has lasted right up to and through the movies release this weekend. Fortunately, I am not a part of that subset. I am a part of the movie loving public that likes to see movies prove their worth on their own terms, and not have to fight off non-existent foes before their time. With that said, I quite enjoyed this new interpretation of the source, it felt true in spirit but does not find itself beholden to what came before, meaning it has a distinctly different flavor than Guillermo del Toro’s vision. This is a good one. I have seen this Hellboy movie referred to as the heavy metal cousin to Del Toro’s films. This is an apt way of describing the relationship. This film sets itself apart immediately by being rated R, and it earns that rating. This movie is loaded with violence, language, and blood. Where the earlier films leaned to the fantasy side of the source’s nature, this time out we swing decidedly towards the horror end of the genre spectrum. This film was directed by Neil Marshall, a fact I did not learn until just before I saw the movie. He brings his genre and cult sensibilities to the film, skills that he honed on earlier films like Dog Soldiers and Doomsday. He brings a much more rough and tumble, freewheeling nature to character and the movie as a whole. The whole production, despite whatever troubles have been reported on, has produced a movie that maintains the feel of what Del Toro brought to the screen, while also rubbing it up with some sandpaper, giving it that rough edged, heavy metal and horror feel. The result is a movie that is really a lot more enjoyable than I was expecting it to be. I will admit that I would have liked the see Del Toro and Ron Perlman team for a third film, but the more time that passed since the second film, the less likely such an outing seemed. 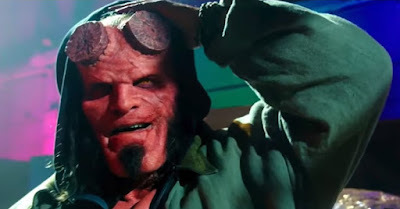 At the same time, I had a hard time reconciling seeing someone else in the role, as Perlman seems to perfectly embody all that is Hellboy, much like Robert Englund is Freddy Krueger or Doug Bradley is Pinhead. With that said, David Harbour has proved himself worthy of the mantle and ably handles his duties and holding the down the role and giving us what we, well me at least, want. I know I haven’t spoken much about the plot, I will leave that to other writers, or for you to discover when you see the movie. The main thing that I want to convey just much fun this movie is. It may be a reboot, but it is not a mere copy of what was done before, this is a new story and a new style. I left the theater satisfied and with a smile on my face. This truly is a heavy metal movie. 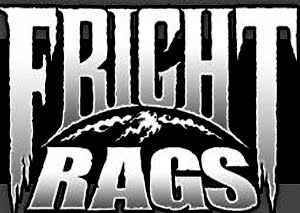 This is certainly a movie to have some fun with and I am truly hoping that we get a sequel. One last thing I would like to mention, besides the solid story told in the film, I really liked the idea of family. Much like Shazam, this movie has an undercurrent of family is who you choose, that it need not be traditional, it can be adopted and be just as strong as if it were blood. 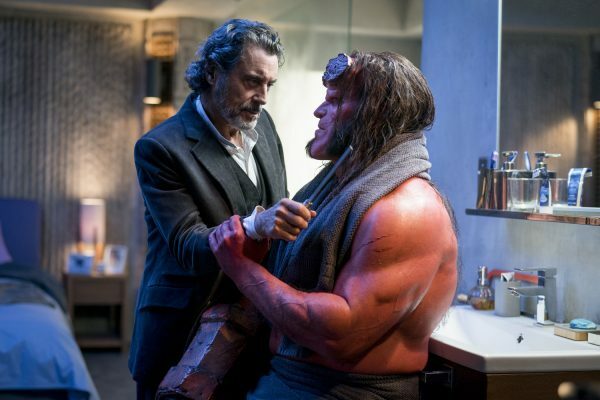 Hellboy’s relationship with Broom (Ian McShane), with their son/father dynamic, and also Hellboy’s relationship with Alice (Sasha Lane), with the uncle/niece dynamic. The point is driven home by the relationship tha Nimue (Milla Jovovich) wants with our hero, saying while it may seem right, you can recognize toxic people and cut them out of your life. You choose who your family is and who you want to surround yourself with.